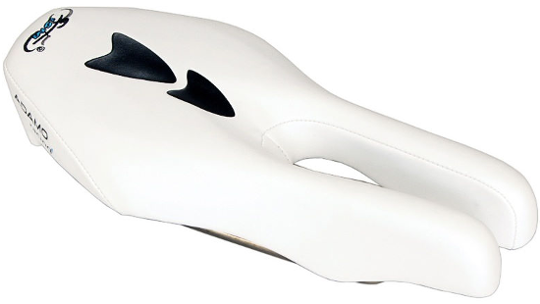 THE ORIGINAL – and still Adamo's top of the line performance saddle for triathletes and time trialists. Fully UCI legal, features a nifty transition rack hook on the back for racking your bike and uses light weight foam and gel pads with titanium alloy rails. 245mm long and 130mm wide. 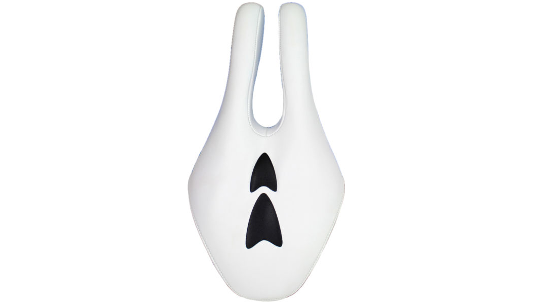 THE ORIGINAL – and still Adamo's top of the line performance saddle for triathletes and time trialists. Designed for aggressive riding in the 0* to 30* hip angle position (aero bars). This seat offers superb comfort in a normally uncomfortable position. The Adamo Racing is completely UCI compliant for time trialing. It even sports a nifty transition rack hook on the back for racking your bike. Uses light weight foam and gel pads with titanium alloy rails. 245mm long and 130mm wide.